Some members were away this week but there was plenty going on nonetheless. It was wonderful that Robyn Jms could join us. Robyn has been very ill. We were able to finally give her the Cup she had won for first place at our show in August. We also heard that one of the quilts we had donated to Inala has raised just over $700 for them which is very pleasing. Elva told us that she will bring Norma to our Christmas Party in December. I am sure she will be the centre of attention and will enjoy catching up with everybody. Two ladies from Westmead will be visiting us next week. They are going to speak to us about the quilts they want us to make for their special "Kangarooathon" in May next year. "Kangaroo Care" is where a new mother is encouraged to hold her baby close, skin to skin, for warmth and contact. The quilts will be placed over them both during this time. A kangaroo logo is to be included in the quilt and a particular colour to be used. I will have more details after the visit next week. They will also kindly be bringing morning tea. Above is a photo of the quilt we donated to Sydney Community Services, hanging at the Gladesville Shopping Centre. Above is a work in progress. 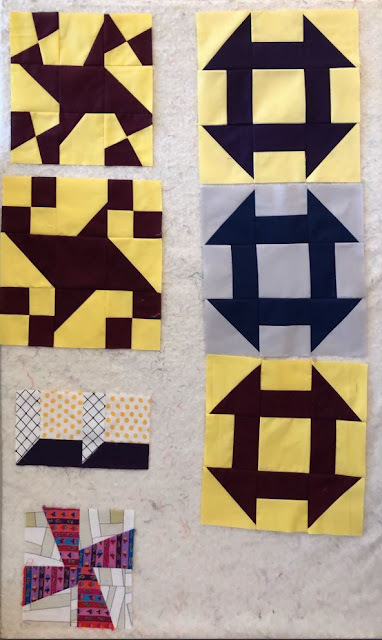 The Churn Dash blocks are for a Community quilt. The top left two blocks are an improv version of the traditional Amish pattern "Indiana Puzzle". This was shown in a class at Material Obsession with Megan Manwaring. Below these is an "Attic Windows" block that I am playing with. I like the 3D effect. Below that a star block to be used somewhere! Above is Elva's beautiful quilt almost finished. Elva has added a kennel for her dog and will add the dog next to it. So many of our members can turn their hand to any craft. Many crochet, sew, knit, embroider, even paint. Such a talented group. This pattern is based on a Wendy Williams design. As you can see, Elva has added her own special touch.